I finished that 2nd and 3rd coats of paint on the body of the "7th Sojourn" tonight and painted the rails with black enamel. Tomorrow, I can mount the rails. I put the first coat of gray paint on the "7th" last night. I’ll put another coat on tonight and sand and paint the pipe that will be the rails with black enamel spray paint. I need to do a little research to determine if the 60-oz NEMA-23 motors that I used on the lathe attachment machine will be strong enough for the 7th. While I have been working on the CNC lathe attachment, I have also been working on another of John Kleinbauer’s CNC designs….the "7th Sojourn." The "7th" is a flat-bed design CNC machine that uses many of the same construction principles as the lathe attachment, and I couldn’t resist building it also since I now have the electronic hardware and software to give it a go. The 7th will cut out parts and do engravings on material up to 9"x14". I intend to use the same controller, etc on this machine as I did on the lathe attachment. I’ll just come up with some quick-connects so that I can move back and forth without difficulty. Last night I completed and dry-fitted all of the wooden (MDF) components for the 7th and they are now ready to be painted. 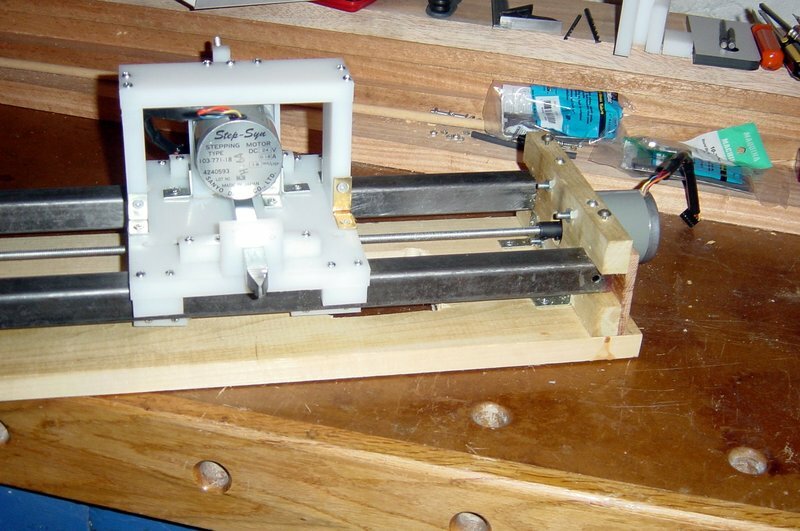 I also bought much of a used z and y axis assembly from John a month or two ago, and that will make progress go much quicker on this machine as I will be re-using many of his scrap parts. My wife is pressing me to get back to my "real" woodworking and build the two Greene & Greene desks that I have promised to build…but I’ve been bitten by the CNC bug lately!! I’d love to do some regular woodworking, but I am obsessed with getting these machines running first!! I’ve just uploaded a bunch of new photos of the completed CNC machine to the CNC Photo album on this website. Click here to view them. I added the carbide tip to the cutter head this weekend and put the CNC machine on weighted saw-horses next to the lathe. It is now ready for a test run sometime this week. Got TurboCNC to work with the FET-3 controller from Stepperworld. If you need an .INI file for the FET-3 click here. You will still need to calibrate your machine, but at least it will configure the motors. I also calibrated the machine to the software and replaced the rigid coupler joint on the Y-axis with the vacuum tubing that John K had originally recommended. He was right, the coupler needs the slight flexibility that the tubing allows to compensate for slight alignment problems. Made a bit more progress last night. I made the wiring a bit neater and put two coats of gray paint onto the machine’s wooden base-plate. The paint will prevent oil from the lead screw from soaking into the wood. I also cut an access hatch (hole) into the base-plate that is large enough to allow adjustments and maintenance to the underside of the cutter-carriage without its removal from the machine. I made a sheet metal hatch cover and screwed it over the hole. Finally, but most importantly, I started to try to get TurboCNC software configured to work with the FET-3 controller board from Stepperworld. I played around with the setting for an hour or so, but could not get TurboCNC to talk to the board. 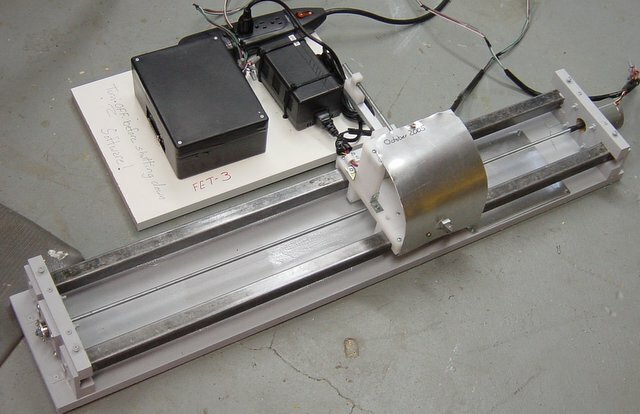 I will email Stepperworld today for TurboCNC configuration hints. I will also try KCAM software tonight. I "jogged" the machine a bit more with the Stepperworld testing software too. I noticed that the lead-screw shows some deflection when the cutter head is between 2 and 3 feet from the stepper-motor. Probably means that the cutter-head carriage is too tight on the rails. May need some adjustment. This machine is definitely the maximum size possible with the thin 1/4" lead-screw. Comments Off on IT’S ALIVE!!! Only small progress this weekend. I wired the spare PC power-supply to the controller board from Stepperworld…easy to do with Stepperworld’s excellent instructions. I also mounted the power-supply and a protective enclosure for the controller board to a piece of plywood to make the unit more portable. Not sure if I am going to mount this board to the main CNC unit, or leave it separate. I also wired a spare stepper motor to the controller board so that I can test the board without hooking it to the CNC machine. I am now fully ready for a test as soon as I get the software for the test onto the old PC. To that end, I finished cleaning all of the extra old software off of the PC, so as to minimize the possibility of old programs screwing up the timing of the CNC control software. Now, I need to hook the PC to my home network (since the CD-ROM drive in the old PC doesn’t work) and transfer the software over to the PC. Hope to do that tonight. I made the "chip guard" for the front of the CNC carriage last night out of aluminum and installed it with screws. I also got the old PC that will be used to control the machine to boot-up. Surprisingly easy for a machine that has not been turned on in six years. The CD-ROM drive does not work, but I probably don’t need it. I can move all of the files to the machine via an old network card. I completed the UHMW carriage on the CNC machine this weekend. The runners for the rails are done and mounted, and the driver-nut for the lead screw has been made and installed. I also ordered a 1/4" coupler from Reid Tool to attach the lead screw to the stepper-motor. Once the coupler is installed, everything underneath the carriage will be done. I tried to connect the lead screw to the stepper-motor using heat-shrink tubing as suggested by John K, but did not like the flexibility that remained in the joint…so I ordered the metal coupler with two set screws instead. Discovered that the UHMW does not need to be tapped to allow for use of machine screws as was recommended in the plan. The UHMW can be self-threaded by the screws themselves (into pilot holes) during construction….a major time-saver. Next step will be the construction of the mechanism that rides on top of the carriage (i.e, the cutter-head and second stepper motor). Yesterday I began work on the cutter-head carriage for the CNC machine. It is to be made out of 1/2-inch think UHMW (ultra-high molecular wieght) plastic. This is the first time that I have done any significant work with plastic. The UHMW plastic machines easily (with my table saw and a standard woodworking blade) without melting or burning as I had feared. It also drills and taps easily. Because it does not have a grain like wood does, it is easy to be very accurate. I expect that I will find many uses for this stuff in the future now that I have been exposed to it. The base of the carriage is now complete. Next I need to make all of the alignment blocks, motor mounts, etc. All will be made of UHMW plastic. I finished the redesigned Mark 2 CNC lathe attachment rails tonight. As I mentioned in an earlier post, I changed the original design to allow for more adjustability for calibrating the distance between the rails, and to provide more strength. I am pleased with the new design. I will post a picture later. It is similar to the design that I described in the earlier post, with a few minor modifications. I also attached the anti-backlash nut assembly and test fit the stepper-motor for the lead screw. Next step will be to build the carriage for the cutter head. I’m not happy with the way the initial rails turned out for my CNC wood lathe-mill project. The long rails are held to the short cross-rails with screws and nuts and small L-brackets. I just can’t seem to get them to hold together as tightly as I would like, and I am afraid the vibration of the final machine will shake the screw/nut combinations apart too quickly. So, I’ve scrapped the original design and I’ve begun making a new design for the side pieces of the railbed using plywood. I laminated the hardwood-plywood up to 1" thick, and then I used the hollow-chisel mortiser to cut 1" square openings for the long square rails. Seems like it will work, but we’ll see tonight. I’m still working out the best way to secure the rails to the plywood ends with the adjustable-accuracy and a minimum of movement that I want. I’m over-building the rails a bit because my plan is to modify John Kleinbauer’s design (after I have it working as John did) to allow for several different tools to ride on the tool-sled. Also, I intend to install a 3rd stepper motor on the lathe’s axis through the lathe’s hollow handwheel to allow for rotary motion. Will it work??? Maybe…I am sure it can be done, the question is whether "I" can do it. I’m a woodworker, not a machinist. Software to operate the rotary motion may be the hard part. Rube Goldberg, watch out! I also made the anti-backlash nut according to John K’s instructions, and I really like his design. It is simple, sturdy and I think it will work very well. I made it out of the plastic from an old router table insert that I had laying around that doesn’t fit my current router table. The antibacklash-nut is ready to be mounted to the rail assembly as soon as I complete the new rails. The stepper motors and Economy FET-3 controller board arrived from Stepperworld.com over the weekend and the parts look good. Now I need to get the old computer that I have stored somewhere in the basement functional again to drive it. According to all I have read, any old computer will do, no real computing power needed. This is good, because the old computer that I intend to use is at least 8 years old, maybe more. It hasn’t even been turned on in at least 3 years. To keep them straight in my head, I’m calling the CNC Lathe attachment that I am currently making the "Mark 2" as the "Mark 1" was the machine that I built last year with unsatisfactory results (too much vibration and wiggle in the cutter head). The "Mark 1" was not CNC, it used a fixed template for guidance. 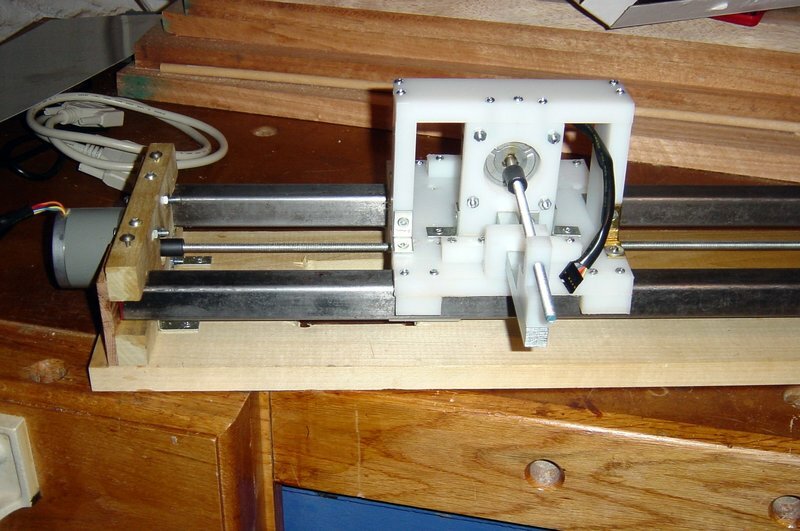 The "Mark 2" is largely a clone of John K’s Wood Turtle CNC. After I have the Mark 2 operational to the point that John K took it, I will build a new tool sled for it of my own design. This will be the "Mark 3" and is my ultimate goal. I temporarily converted the woodshop into a metal/machine shop over the 4th of July weekend for the lathe milling attachment project and the garden railroad trackbed. These projects are a little off-topic for this blog, but they are both being produced in my "shop" so they will be included in this blog. We began to break ground on the new garden railroad. As you can see on the Sanfilippo.info site, we had a garden railroad at our old home, but since we move 3 years ago the railroad has been in storage while more high-priority projects were completed (we run mostly LGB equipment). I intend to start small and get a loop of outdoor track running, and then grow from there. The test pieces of flexible trackbed that I made a few weeks ago were installed and work great (based on Bill Logan’s design). Stable, flexible…looking good. I now need to make another 60 feet or so of trackbed in the shop before we can hit the yard again. We are probably two weeks or so from running the trains on the new trackbed…I’d say a target date would be the weekend of July 30th. Additionally, I began to cut the metal rails for the lathe-attachment milling machine. They are made out of 1" square tubing from Home Depot. The tubes cut easily with a metal cutting blade in the reciprocating saw and then they are ground smooth on the grinder. Overall the rail frame will be 36" long and about 6" wide at the base. Finally, my son and I painted the Adirondack chairs and put them in the yard, they look good. Three projects going at once! (not counting the desks that are on hold for the moment)….I like it like that.